Although October is Down syndrome awareness month, every day is full of awareness for families and friends of those affected by Down syndrome. Show that you love, support and understand Down syndrome by wearing your Personalized Down Syndrome Awareness Shirt at your next community walk event. Our Personalized Down Syndrome T-Shirt is great for any upcoming Down syndrome Awareness Walk Event and shows that you too are there to support and help spread awareness. 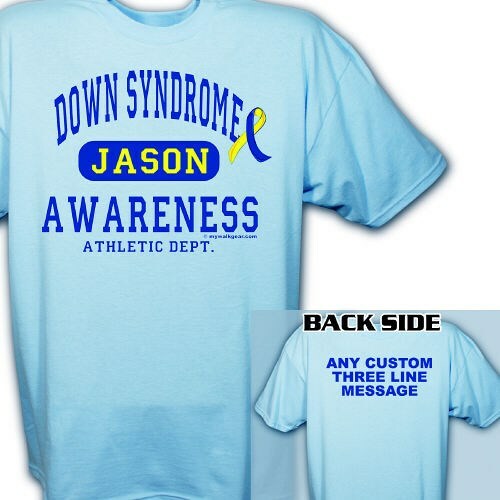 Our Personalized Down Syndrome Awareness Shirts are available on our premium preshrunk Light Blue 100% cotton Personalized T-Shirt , machine washable in youth XS-L and adult sizes S-3XL. Includes FREE Personalization! We will personalize the front of each shirt with any name (ie. Jason) and the back of each T-Shirt with any three line custom message. i ordered my t shirts and cooley cups awesome stuff! !